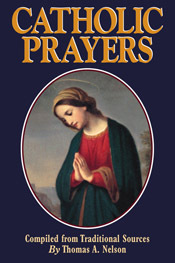 This is probably the greatest little Catholic prayerbook you will ever encounter because it has over 100 Traditional Catholic prayers and is comprised of 4 Parts or sections: Part I contains the common prayers every Catholic should know by heart over 25 including the Acts of Faith, Hope, Love and Contrition, plus numerous short invocations. Part II contains over 25 especially powerful prayers: to Our lady, St. Joseph, St. Anne, St. Jude, St. Philomena, St. Anthony, etc. Part III contains miscellaneous favorite prayers: e.g., Morning Offering, Prayers to Our Lady, to St. Joseph for Purity, to overcome a bad habit, for grace, the Te Deum, Consecration to the Holy Ghost, etc. And Part IV contains various other "favorite prayers," such as for a happy death, the choice of a state of life, for priests, Fatima Prayers, for safe delivery of a baby, for the dying, for the dead, for the Poor Souls, etc. For a small package, this little Prayerbook is dynamite, and should be carried by all! Large Print. This beautiful rosary pouch will keep your rosary safe in the harshest conditions! A rosary case will safeguard your rosary, whether in your pocket, purse, or stored somewhere. This rosary pouch features thick lining and a zippered opening. Choose between 3-inch or 4-inch length. An Exorcist Tells His Story has been a European best-seller that has gone through numerous printings and editions. No other book today so thoroughly and concisely discusses the topic of exorcism. 210 pages. From the creation of the world to the infancy of the Church, the important stories from both the Old and New Testament are vividly retold and illustrated for young people. Also included are chapters on the prophets and the psalms. In the back is a glossary of important people, places and objects, providing added information. Ages 6 and up. 238 pages. This small book written by Sister Emmanuel of Medjugorje contains an interview with Maria Simma, an elderly Austrian woman, who testifies to being regularly visited by souls in Purgatory who answer secrets about that realm and who plead for the prayers of the living. Saint Michael Deluxe Chaplet with Black Wood Beads Packaged with a Laminated Holy Card and Instruction Pamphlet (Overall 6.5" x 3.5"). This St Michael Chaplet features the CatholicShop.com money-back guarantee. The St. Michael Prayer is once again being prayed daily for the intention of Religious Liberty in America! THE LAST APPARITION goes well beyond the basics of what author Wayne Weible calls the most important event happening in the world today the ongoing daily apparitions of the Blessed Virgin Mary to six chosen visionaries in the little village of Medjugorje in Bosnia-Herzegovina. It is packed with vital new information in addition to the basic story of its beginnings and where it is today. Included is startling commentary on the alleged secrets and how they will change the world forever. Underlying the story is the disclosure by the Mother of Jesus that she will never come to earth again in apparition. THE LAST APPARITION is a must read!